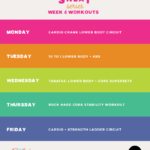 As far as week 4 goes, we’ve got some AMAZING workouts planned for you along with a fun breakfast smoothie week Monday-Friday in the meal plan. Feel free to create your own smoothie, or use the recipes posted in this week’s meal plan. Either way don’t forget to keep gramming your photos and sharing the love with us! If you make a smoothie, be sure to tag #sweatseriessmoothie on Instagram. We love seeing your creations & workouts! Now let’s get to this week’s workouts! This week it’s all about the BOOTY! Work, work, work it. Please also feel free to use the #SummerSweatSeries hashtag and we’ll regram our favorites! 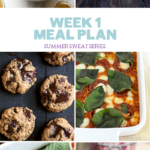 2 Responses to "Summer Sweat Series 2016: Week 4 Fitness Plan"
Hi,I liked your plan but I haven’t followed them yet. How can I follow you?